Trijuti, or Tribhagi, is three naturally joined Rudrakshas to form a single Rudraksha. 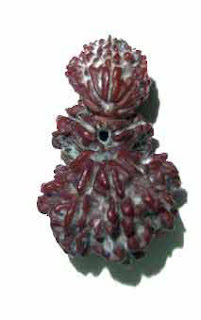 It is found very rarely and such Rudraksha is also known as Gauri Paath or Brahma Vishnu Mahesh. It is said that only two to three Trijuit Rudraksha bead appear in the market for sale and prices of it are around Rupees 250,000. The rarity of the Trijuti bead has created a thriving fake market for it. You will find numerous online sites selling Trijuti beads and even a Rudraksha bead expert cannot find the difference between the fake and real. Fresh and expert methods are used to join three beads to make Trijuti. In rare instances, Gauri Shankar bead (two naturally joined beads) is attached artificially to create a Trijuti. Indra Mala, a mala consisting of Rudraksha from 1 mukhi to 21 mukhi, is complete only when a Trijuti bead is part of it. Each Rudraksha has a particular benefit attributed to it and it is believed that the wearer of Trijuti Rudraksha will gain confidence and thereby find desired results in all activities. There are no known healing powers to this Rudraksha as is attributed to the others.